[Episcopal News Service – San Juan, Puerto Rico] In the immediate aftermath of Hurricane Maria, Puerto Rico Bishop Rafael Morales Maldonado issued an order for all Episcopal churches on the island to open their doors to the community. In doing so, the churches became points of distribution for emergency supplies, and also symbols of hope. “I believe the Episcopal Church in Puerto Rico was, after the hurricane, and is a great beacon of hope in this country,” said Morales in an interview with Episcopal News Service in his office in Trujillo Alto, a municipality within metropolitan San Juan. Those efforts continue as the diocese, in partnership with other agencies and organizations, continues to offer mission and education fairs in communities across the island. The most recent took place in Yabucoa on Sept. 20, the one-year anniversary of the hurricane. On that date in 2017, Hurricane Maria made landfall as a Category 4 storm in Yabucoa, on the island’s southwest side, bringing 155 mph winds, massive rains and flooding across the island. The diocese, with assistance from medical staff from St. Luke’s Episcopal Hospital, its facility in Ponce, has conducted regular mission and education fairs over the past year. The fair on Sept. 20, however, included a special service to remember the thousands of lives lost, and survivors still affected and mourning. And then, in partnership with the Diocese of New York, Morales participated in a Eucharist in remembrance of Maria’s victims on Sunday, Sept. 23 at Church of the Intercession in Manhattan. New York City is home to more than 700,000 Puerto Ricans, the largest diaspora on the mainland. Though the initial death toll stood at 64 people, thousands of others died in the storm’s aftermath, some from medical needs that went untreated. A recent study recorded 2,975 deaths. Many residents were without electricity for months, and some in remote regions still don’t have power. Puerto Rico is a U.S. territory; its 3.3 million residents are U.S. citizens. The Diocese of Puerto Rico – with 5,000 Episcopalians – is part of the Episcopal Church’s Province IX. Of the diocese’s 87 buildings, 66 sustained damage. Emergency repairs were made so that the doors could open; if the structures weren’t safe, the bishop’s mandate was to set up a table outside. When Maria hit, neither the government nor nongovernmental institutions, including the diocese, had disaster plans in place. Diocesan staff sprang into action and divided the island into four quadrants, assessing damage and distributing food, water and other emergency supplies. In late September and into early October, the diocese received 17 shipping containers full of emergency supplies – food, water and generators – which it sent to churches to distribute to communities, though it took a full two weeks and the use of four-wheel drive vehicles before remote communities could be reached. “The people saw the trucks coming and they came out into the streets,” said Salinas. Loíza, a town of some 4,700 people known in the past for its high murder rate, was one of the hardest hit areas on the northeast end of the island. It lies at the end of a 25-minute scenic drive along Highway 187 from San Juan. Many of its residents still live with blue tarpaulins on their roofs. Loíza was one of the communities affected by Hurricane Irma, which hit on Sept. 6, 2017. The Virgin Islands bore the brunt of Irma, but it also caused major flooding in some areas of Puerto Rico. 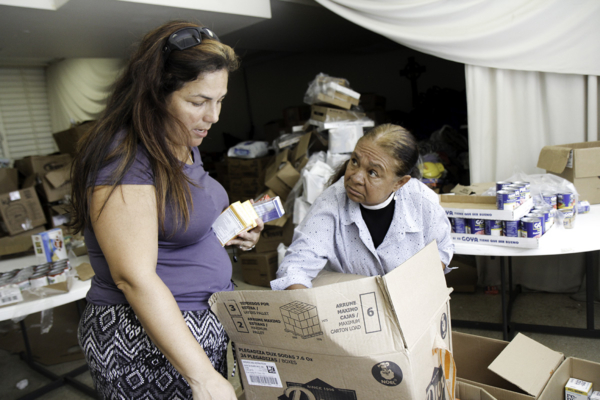 Loíza and nearby areas were already struggling, and their need increased after the hurricanes. 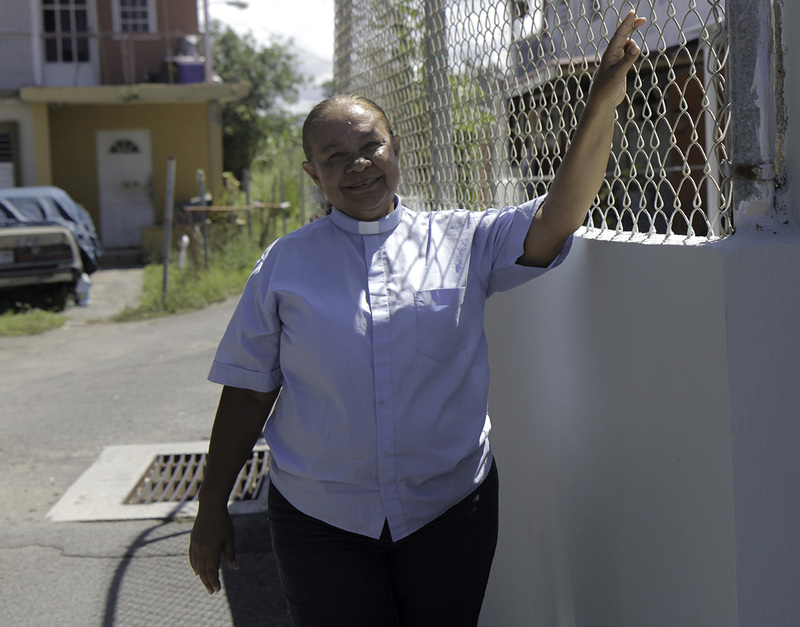 Méndez, who now coordinates the diocese’s disaster response program, already has made inroads into the community, providing services to teenage and single mothers and training them to be self-sufficient. The church also provides meals to some 500 housebound people. Edith Verdejo, a longtime member of St. James and St. Philip, echoed that sentiment. 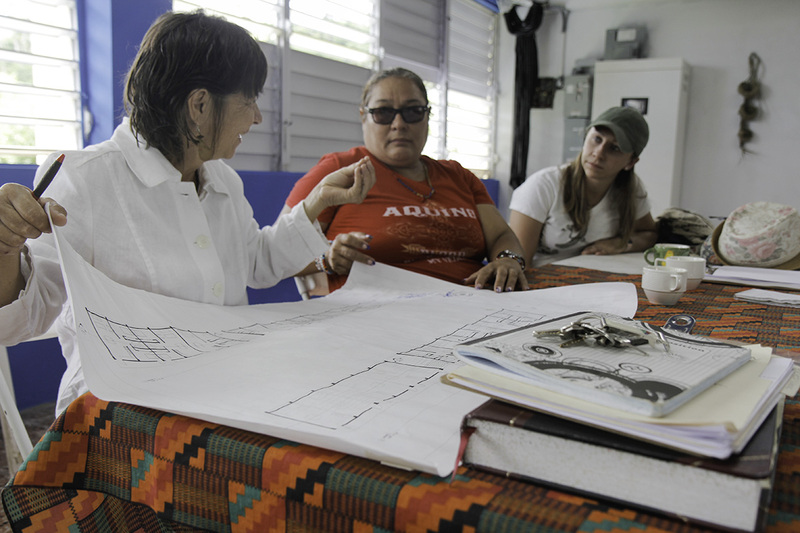 Verdejo, who’s also a community leader, worked to connect the church to other community organizations and the local government to coordinate a response. Together, they worked to help property owners secure the deeds to their dwellings, distribute supplies and establish disaster protocols. The governmental response, particularly the federal response, has been criticized, while President Donald Trump has continued to say the revised death toll was fabricated. In the future, the diocese and its churches want to be better prepared. In partnership with Episcopal Relief & Development, they are implementing a diocesan response strategy. Episcopal Relief & Development is committed to working with the Diocese of Puerto Rico on the Recovery and Preparedness program, REDES, for the next several years. The program is currently focused on supporting pastoral care and mental health, and providing housing repair and livelihood recovery to households impacted by Hurricanes Irma and Maria. REDES collaborates through and with the 52 congregations in the diocese, connecting resources and volunteers, conducting preparedness assessments for future all-hazards planning, and supporting clergy and lay leaders on a variety of disaster preparedness activities. “We are grateful to be able to support the Episcopal Diocese of Puerto Rico as it acts as a beacon of hope to so many who have lost so much, and continue on the long road of recovery,” said Abagail Nelson, senior vice president of programs for Episcopal Relief & Development. St. Luke’s Episcopal Hospital in Ponce, like other hospitals on the island, struggled with electricity after the storm. As the 2018 hurricane season was reaching its peak and Hurricane Isaac posted a threat to the island, Dr. William Santiago, medical director, said in an interview with ENS at the hospital that it had contingency plans in place, including many more generators on hand. Beyond preparing for the next disaster, the diocese continues to respond to last year’s hurricanes. Not all who suffered damage to or loss of their homes qualify for assistance from the Federal Emergency Management Agency. For instance, it can be difficult to prove ownership of a dwelling that’s been lived in by and handed down through generations, as is more often the case in rural communities. The diocese created a relief fund with a $200,000 donation from Trinity Church Wall Street in New York to assist residents who are ineligible for federal disaster funds. Those funds can go to assist people like Luis Oliveras’ neighbors. Oliveras, who coordinates the diocese’s disaster response in the southern district, witnessed seven of his neighbors, who lived in wooden houses, lose everything. Oliveras lives in a mountainous region in the southwest, where the majority of people work in agriculture on coffee, plantain and citrus plantations. Many of the farmers, who struggle to make a living even during good times, live in wooden houses rather than sturdier concrete structures. As their plight demonstrates, it’s the people struggling to make ends meet during regular times who really suffer in the aftermath of a disaster. Many people were left homeless. 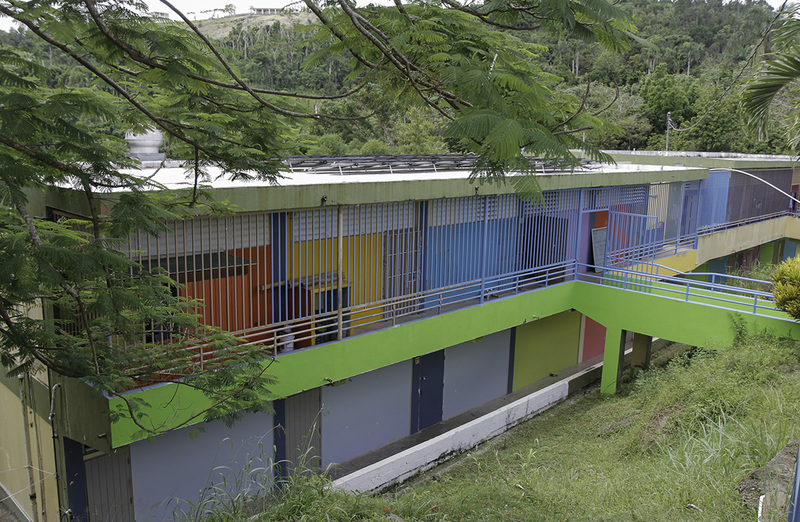 One creative endeavor supported by the diocese and St. Bartholomew’s Church in Bartolo was the conversion of a vacant pubic school into a short-term – now long-term – response to a housing shortage. Before Maria, Puerto Rico’s financial crisis made headlines, a situation exacerbated by the hurricanes as even more residents have fled the island. A year ago, Puerto Rico’s government closed 167 public schools; this year it plans to close 265 more. 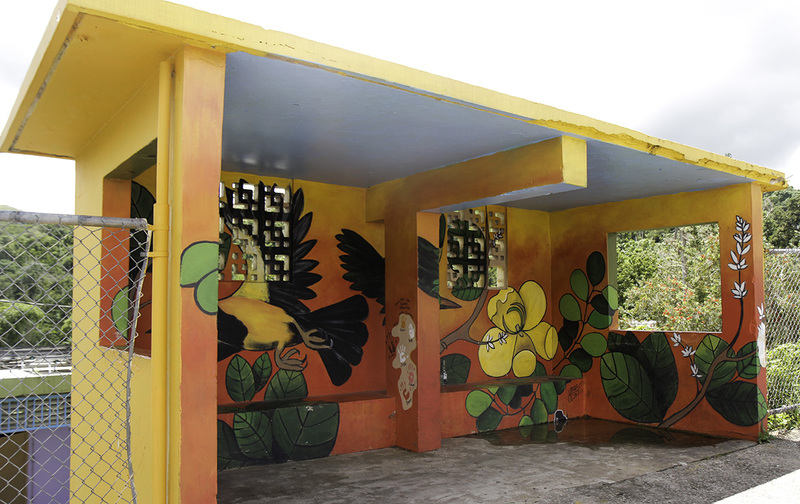 One of those schools closed is in Bartolo, where Elisa Sanchez, a community organizer who has been active in Puerto Rico’s Occupy Movement and in a network of grassroots support centers across the island, has worked to transform the school into 15 residences, a community center offering art and other workshops, and a museum and coffee shop operated by young people. The hope is to secure a projector so that the coffee shop can screen movies. Sanchez has received more than $180,000 in interfaith support for the school’s transformation; a volunteer crew from Washington National Cathedral helped to paint the building’s interior. Sanchez now is working with Episcopal Social Services, a diocesan program, and the Rev. Carlos Vélez, the priest at St. Bartholomew’s, just up the street, to persuade the government to transfer the property to the church. In the 1920s, the church owned the 5 acres land, which it later sold to the government to build the school – the first vocational agricultural school on the island. Residents feel pride in bringing the region’s agriculture and the school back to life, she said. At one time, there were 50 coffee plantations near Bartolo. Today, still, there are coffee, plantain and citrus plantations in Puerto Rico, but less than 2 percent of the population works in agriculture. There’s an effort to revive smaller farms, and restaurants are beginning to tout locally grown food. The hope is to revitalize agriculture and agro-tourism, making Bartolo a brand, something for the community to be proud of as it continues to recover. Bartolo was devastated by the storm, and the local government has always supported the plantation owners, not the farmers, Sanchez said. “We were going to occupy this space temporarily, but the strategy [now] is to keep this place permanently occupied,” said Sanchez. The school doesn’t just provide housing; it provides support for women fleeing domestic violence. Mothers and their children have a safe place, and the mothers receive self-sufficiency training. Farmers need assistance, too, and to that end, Sanchez and others are working on a community agriculture project. The hope, said Sanchez, is to rebrand the region based on agricultural products. – Lynette Wilson is a reporter and editor for Episcopal News Service.